It's an early start this morning as I head for the Place Maubert Market. 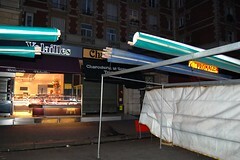 I'm told it opens at 7am but instead of finding a bustling market I find it's still in the process of being setup. Actually, it's still quite dark but I do manage to get a few shots. Calling a halt due to bad light, I decide to brave a nearby cafe and try out my trusty rusty french. So stealing myself I enter, standing at the bar, I manage to get the attention of the tender, a burly moustachioed man, cigarette dangling from the corner of his lip, "cafe au lait, s'il vous plait" I manage to utter. He nods and heads for the coffee machine - a success! Feeling quite pleased with myself I stand at the bar (because all the other patrons are also standing at the bar) as my coffee arrives - one cafe au lait as ordered! By the time I emerge it's lightened up considerably but the market is still a way off from being ready. 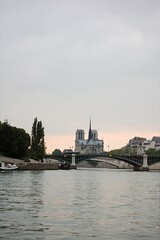 It's this time that I finally see it - Notre Dame is just at the end of the street!. It really is close - this really makes me feel a whole lot better. After taking a few more market shots I decide to spend some time at Notre Dame before returning to see the market in full working order. Standing before Notre Dame it is an impressive sight - and though I feel a certain moistness in my eyes, it's not from the church's grandeur but from the incredibly overwhelming stench of urine. While trying not to breath I manage to enter the church itself and the only thought that went through my mind was WOW. I don't think I've ever seen a church to match the size and scale of this. It's actually overwhelming. 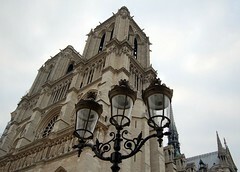 Since I've filled up the SD cards I decide to stop for breakfast at a cafe that overlooks Notre Dame. They have a "typical french breakfast" special for €9. 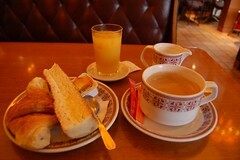 What you get is a small orange juice, a croissant & piece of baguette (with butter and jam) and a coffee of your choice. It was adequate but I'd probably have to say overpriced but it was a comfortable way to load all those photos onto the Ipod. Armed with empty cards I now head to the nearby batobus stop opposite Notre Dame - I purchase a two day unlimited travel card - it's only €13. 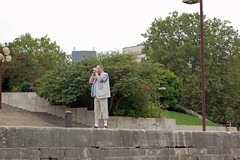 At Jardine des Plantes the boat turns around and heads up the right hand branch of the Seine giving you good views of Ile St Louise and Ile de la Cité. 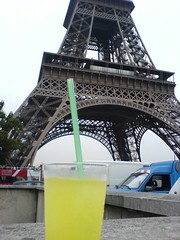 It then stops at Hôtel de Ville, Louvre, Champs Elysee and finally the Eiffel Tower (where it once again turns around). 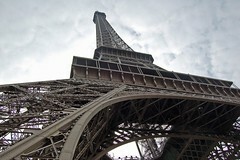 I hop off at the Eiffel Tower and once again find that I've filled up the SD cards. As it's a bit warm I get myself a €3 granita that wasn't very frozen and wait while the photos are transfered. It's as I'm standing here with my overpriced liquid granita and with wires dangling from my black bag that I wonder how sensible it is to be standing in front of the eiffel tower carrying a bag with dangling wires. 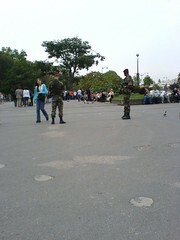 I'm glad that these guys didn't see me with my wired bag. I don't know if this will be very popular but the eiffel tower is umm, kinda boring. It's just a big metal antenna. Once again I thought I'd have a more positive reaction but it's just a let down. I might make another t-shirt that says "I went to the eiffel tower and all I saw was an antenna." 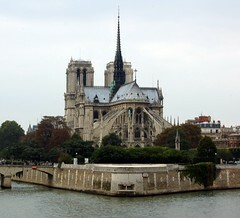 Having seen enough of the eiffel tower I head back to the boat and the notre dame stop for another visit to the market. This time its in full swing (its mid-morning now) and I manage to purchase a few items to see me through the next two days. Fresh food prices, to me, seem very reasonable - there's also a range of items that we could only dream of having. One stall is selling Lagioule products - should I get that Lagioule waiters friend or not? I decide to pass on it this time - I don't know if I can survive another temptation. I spend the next few hours going up and down the river - I'm looking to get some twilight shots. 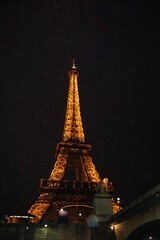 I arrive at the Eiffel Tower when it's too dark and decide to call it a night and head back home.